I enter every week hoping to win…maybe this will be the week! I like (love) totally target on facebook! Good luck everyone!!!! This is a great giveaway! Hope I win! 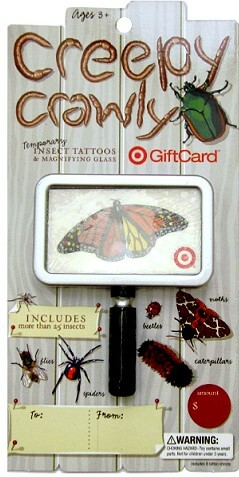 I love Totally Target and the giveaways! Oh wow my boys would so love the bug tatoos. Anything bug related and they r happy. And the gift card wowould be awesome for me. Thanks so much. I like Totally Target on FB too! This would come in handy right now since I have some gifts to buy. Thanks for the giveaway! This card is so clever! Totally Target is the best! How fun! Thanks for the cool opportunity! Still trying, but Iove the opportunity to enter these gift card giveaways. Love the site! Thanks so much for sharing! I check TT twice a day for deals, love the site! I like your Facebook site, lots of great info! What a creepy way to shop. Have a great weekend, Totally Target fans! You KNOW I’m a Totally Target FB fan, follower, liker, lover, stalker! I love Target!!! Hope to win! Very cool giftcard, thanks for the giveaway! I would “bug out” if I won, thanks for all the great info on this site. I love it and am sharing the love….